Hardwood, probably mahogany, hinged lid. Upper surface is finished with a thick (7mm) veneer of walnut. The case has a lock with a brass escutcheon, consisting of a brass inlaid black rectangular nameplate (3.3cm by 1.5cm) on the outer surface of the veneered lid. Two lacquered brass inlaid straps (1.3cm wide) are inlaid and secured with brass screws into the outer aspect of the case lid, continuing onto the anterior and posterior surfaces of the case. 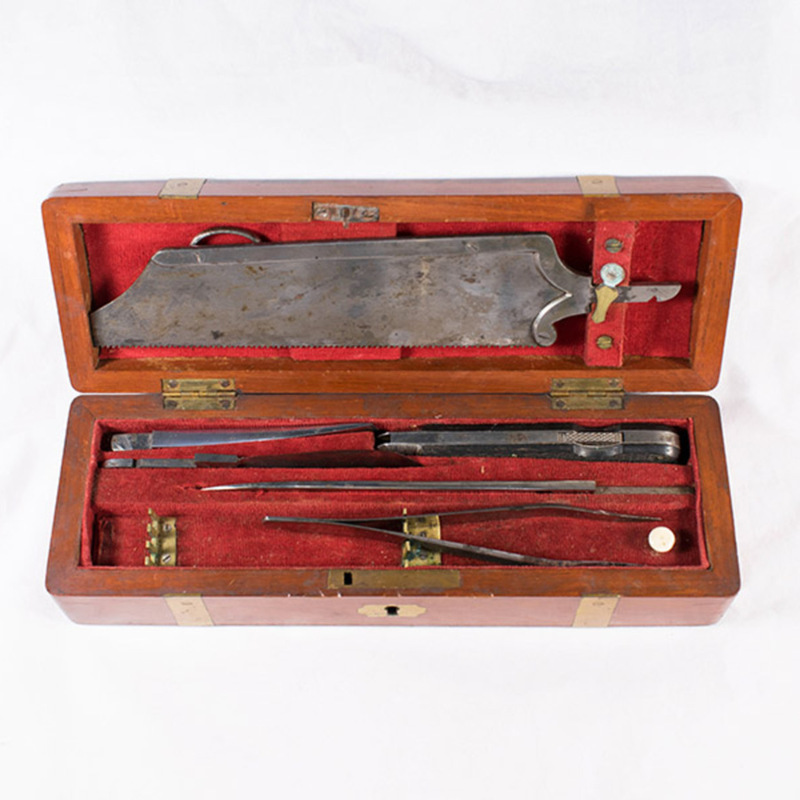 Instruments: Twelve in number, of which six have fitted recesses in the case itself, two are located in brass slots on the upper surface of the removable compartment lid with ivory button. The remainder are loose and kept in the internal compartment of the case. 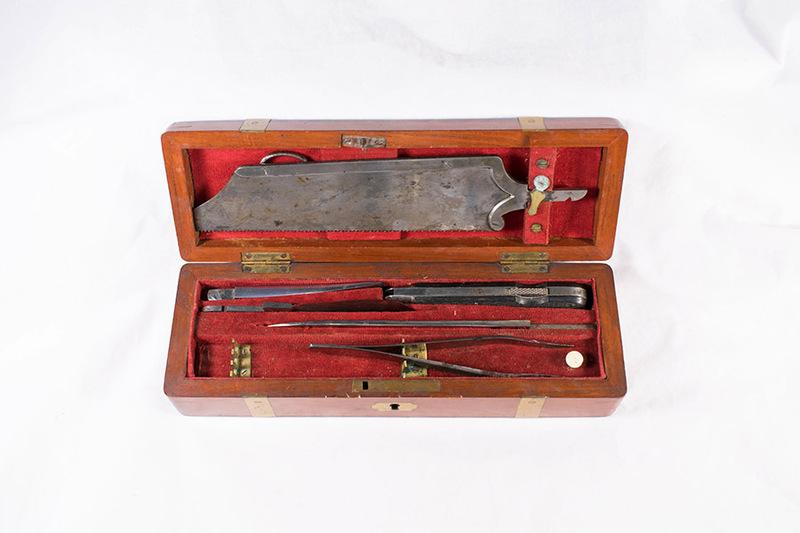 “Cased set of Post-mortem instruments,” Heritage, accessed April 22, 2019, https://heritage.rcpsg.ac.uk/items/show/312. Description: Hardwood, probably mahogany, hinged lid. Upper surface is finished with a thick (7mm) veneer of walnut. 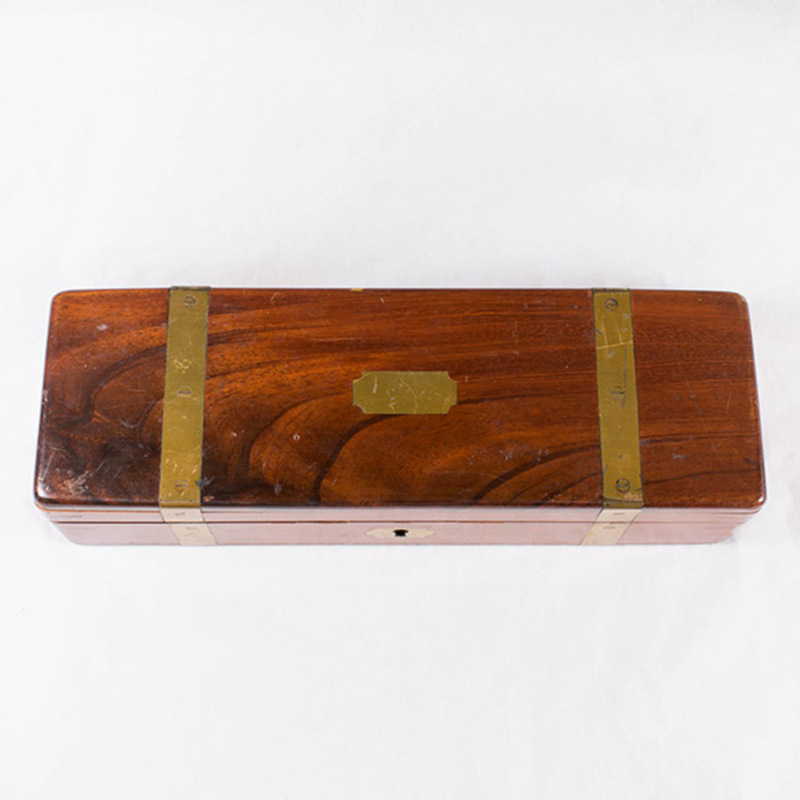 The case has a lock with a brass escutcheon, consisting of a brass inlaid black rectangular nameplate (3.3cm by 1.5cm) on the outer surface of the veneered lid. Two lacquered brass inlaid straps (1.3cm wide) are inlaid and secured with brass screws into the outer aspect of the case lid, continuing onto the anterior and posterior surfaces of the case. Lining of the case consists of closely applied red velvet, with fitted recesses for each instrument, and also a lined internal compartment (2.2cm by 21.4cm) for small loose objects, with fitted lid (covered with red velvet and with ivory button as a handle.) 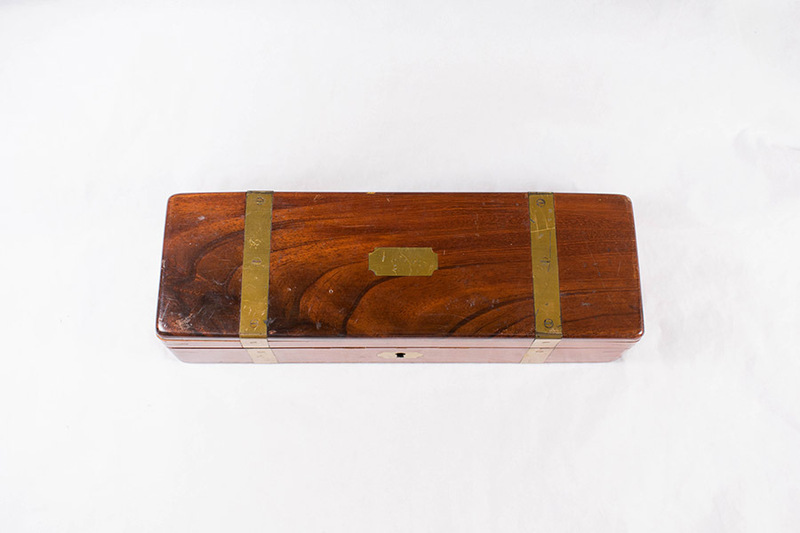 Instruments: Twelve in number, of which six have fitted recesses in the case itself, two are located in brass slots on the upper surface of the removable compartment lid with ivory button. The remainder are loose and kept in the internal compartment of the case.